Living on a golf course is a dream for many golfers. Social researchers refer to this phenomenon as ‘lifestyle living’ where residents seek to live in a location that enhances their desired lifestyle, whether it be access to the beach, to their boat, to the golf course or a vibrant city life. On Course living is a dream for many -- even for those who don't play golf. Golf residential developments are not new. They have been with us for decades, particularly in the United States where golf resorts and golf residential areas boomed for over 40 years only to come to a screaming halt over the past few years. One of the original golf residential communities was Wentworth Golf Club in Surrey in The United Kingdom. Built in the 1920’s it is now the home of The European PGA and famous golfers such as Sir Nick Faldo and Ernie Els. In Australia, the first golf residential projects were built by housebuilding giant A V Jennings at Turu Beach on the southern coast of NSW and at The Launceston Casino in Tasmania. These were followed in the 1980’s by landmark projects such as Mike Gore’s bold Sanctuary Cove on The Gold Coast and Christopher Skase’s Mirage at Port Douglas. Both projects were pioneers in integrated residential development and set a new benchmark for development. Sanctuary Cove was to become Australia’s largest brick paving project as all the roads were brick paved. Legendary golfer Arnold Palmer designed the golf course and a concert by Frank Sinatra launched the project amid unprecedented hype. At Port Douglas, Skase used Thomson Wolveridge to design the course and transformed the sleepy seaside port by importing thousands of established palm trees and put Port Douglas and the Barrier Reef on the international tourist map. 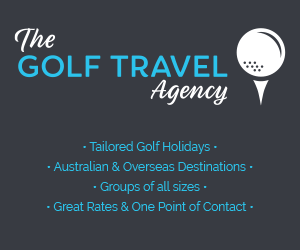 The rest is history as other golf course developers followed with major projects like The National Golf Club in Victoria, Palm Meadows and Hope Island in Queensland and Joondalup and The Vines in Western Australia. The earlier golf projects generally had a resort component and were the forerunners to golf residential communities which are more the norm today. Golf community development has boomed around our capital cities with projects like Sanctuary Lakes, Sandhurst, The Heritage, Moonah Links and 13th Beach around Melbourne, Brookwater and North Lakes in Brisbane and Magenta Shores, Kerwinda Waters and Stone Cutters in Sydney. In the future, golf community development will more likely be in regional cities and the larger country towns where land availability and planning controls are more favourable. Many regional golf courses will secure a sustainable future by embracing associated residential development. The majority of new golf course developments rely on associated residential development to fund the golf course, a fact that some golf purists find abhorrent. Golf Community development has also had its battles in the planning environment as some politicians have referred to golf developments as real estate by stealth. Old hang ups that golf is an elitist game and bad for the environment still exist in government circles but are gradually being broken down by the excellence that the golf industry is promoting. Other key considerations with integrated developments are safety, golf layout and housing design. Technological advances in golf equipment have resulted in the golf ball travelling greater distances, which in turn demands more land for the golf course and greater setbacks for the housing. Safety is essential for community living and whist the incidence of personal injury is very low, property damage is quite common, particularly adjacent to existing courses that predated the surrounding real estate. Whilst golf authorities and golf architects are reluctant to set arbitrary limits for setbacks they have generally increased in response to changes in technology and the trend towards a more litigious society. Whereas 20 years ago the Urban Land Institute of USA recommended 45 meters as a desirable setback for real estate boundaries from the centreline of the golf hole, most architects would now recommend 70 meters. Internal safety setbacks are generally 60 meters between centrelines. 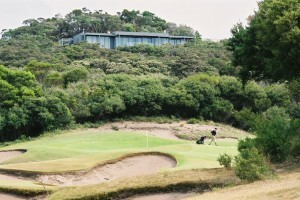 The golf layout must respond to the land form and it is desirable for the residential land to sit above the golf course. Golf holes are generally laid out in pairs to optimise the usage. This improves the views, increases safety and allows the golf course to accommodate stormwater drainage. As the majority of golfers are right handed and slice the ball, it is best to place the real estate on the left side of the hole. Fundamental to living on a golf course is the ability to look over the golf course and enjoy a landscape managed by others. However, the golfers have no desire to look at the houses, so managing the interface between the golf course and the associated development is important. By controlling the orientation of the houses and the design of the interface landscape it is possible to satisfy this potential conflict. It is interesting that only about 30% of those who live on golf courses actually play golf, the majority being attracted by the landscape setting. The interface is further improved by the use of design guidelines that control both building design and the landscape character. Design guidelines work best when they are not overly prescriptive but set principles that inspire creativity and design excellence. Residential golf communities will remain popular in the short- to medium-term providing the current fall off in golf participation does not continue. Hopefully the standard of housing will improve to match the courses which are already of an international standard.